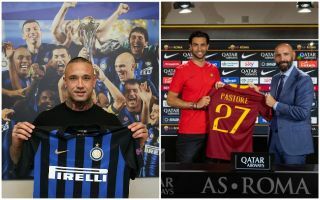 It’s been a busy week for Roma as they confirmed the sale of midfield ace Radja Nainggolan to Inter, while also unveiling three new signings in a matter of hours. The Belgian international has been a key figure for the Giallorossi since joining the club in 2015, scoring six goals and providing 11 assists in 42 appearances last season to help them secure Champions League football again. However, sporting director Monchi is seemingly deciding on a shake up at the club this summer, as Roma have confirmed on their official site that they’ve sold Nainggolan to Inter for an initial fee of €38m. That has in turn given the Roma chief room to manoeuvre it seems, as the Serie A giants have splashed out €24.7m to bring Javier Pastore back to Italy after his stint with Paris Saint-Germain as the Argentine playmaker will look to add creative quality at the Stadio Olimpico next season with Italian football fans fully aware of his class after his previous spell with Palermo. Further, the windfall from Nainggolan’s sale appears to have led to the signing of Davide Santon for €9.5m, while Inter youngster Nicolo Zaniolo has also joined Roma for €4.5m as part of the negotiations between the two clubs. Combined with the likes of Bryan Cristante, Hector Moreno and Justin Kluivert who have already signed for Roma this summer, it’s an exciting time for the Italian giants as they look to kick on under Eusebio Di Francesco and fight for major honours. His initial task will surely be to bridge the gap between themselves and perennial Scudetto contenders Juventus and Napoli, and with the players arriving to strengthen his squad and to also help them compete on various fronts, it promises to be an interesting season next year in the Italian capital.